Illustrator Peta Bridle sent me these beautiful drypoint etchings of some of my favourite people and places in the East End, which she has been working on over the winter. 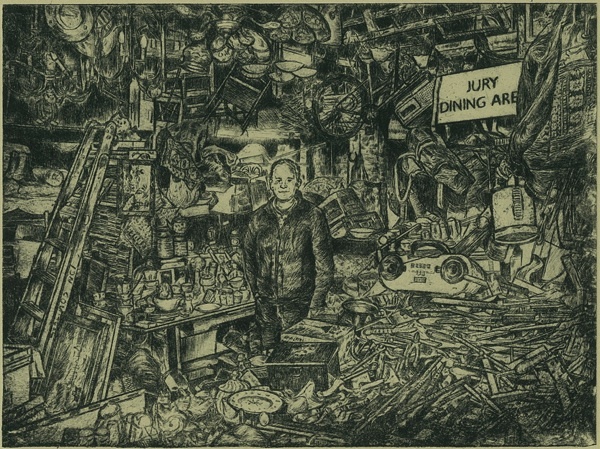 I love all the detail, and the depth of tone and richness of hatching this ancient technique offers, romancing these familiar locations into myth. 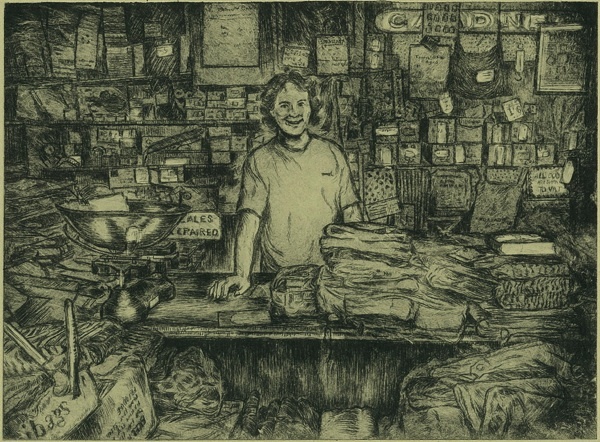 ‘I have drawn the shopkeepers in their places of work as I find them a good subject and I am supportive of independent shops.’ Peta admitted to me, ‘The town where I live is full of supermarkets competing against each other, a few poundshops and little else, so I like to read about all the different shops you describe in the East End.’ We look forward to more drypoint etchings from Peta Bridle. Love the etchings with all their telling detail. I’m not surprised she hasn’t got to grips with Des and Lorraine’s Junk Shop though. It doesn’t look as if anybody could. There must be so many ‘finds’ to be had there though. What detail! I could look at these all day. Makes me want to visit the places. What a treat ! Wonderful prints , let’s see some more please. 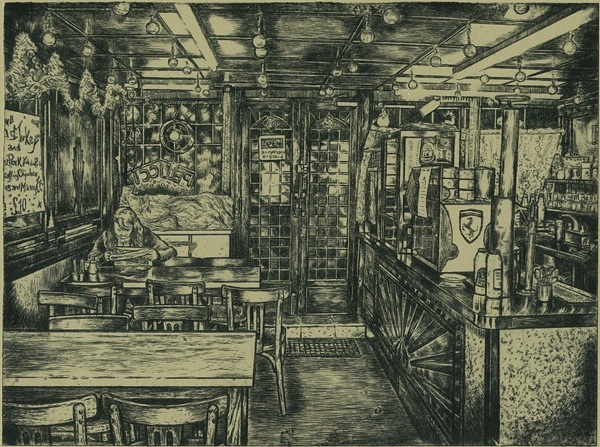 I find these etchings far superior to the normal sketches and paintings. 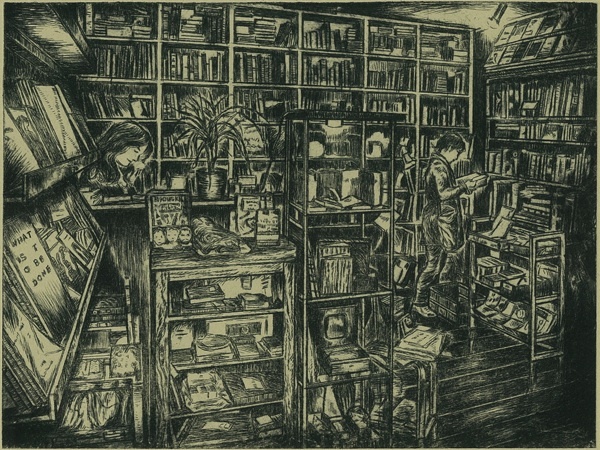 These are great etchings. I’m an art lover as well as an Anglophile, and your posts about Spitalfields are so interesting, so I was doubly (triply?) pleased to read this post. 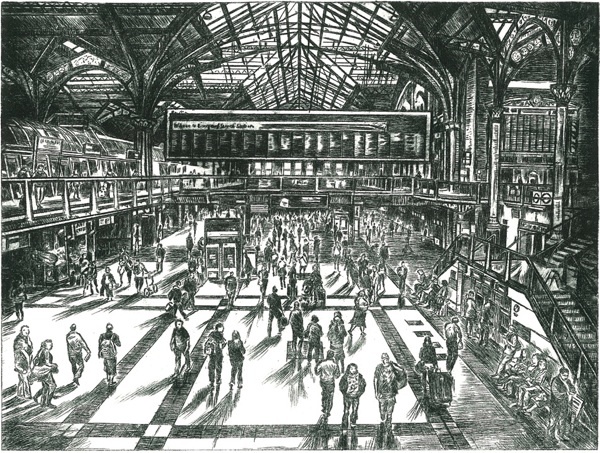 These etching are so detailed and wonderful! And I’m with Peta, I much prefer the smaller privately owned shops over the large chain stores…it’s a pity here in the US so many of the small shops are falling by the wayside. These are super! What’s the process? We were so impressed that we have asked Peta to come and draw Newham Bookshop to celebrate our 35 years. Your etchings blew me away Peta. Wonderful detail. Great that you have been invited back to the bookshop to do further work. Fantastic artwork. I’d really love to buy some prints – Gentle Author, does Peta have a website or dealer/contact where I could order some?